The tee, by artist Bamboota, went on sale at RIPT today, Sunday, March 13, 2011, at midnight CST, and will continue for 24 hours from then, and once it’s over, it will not be sold on the site anymore. 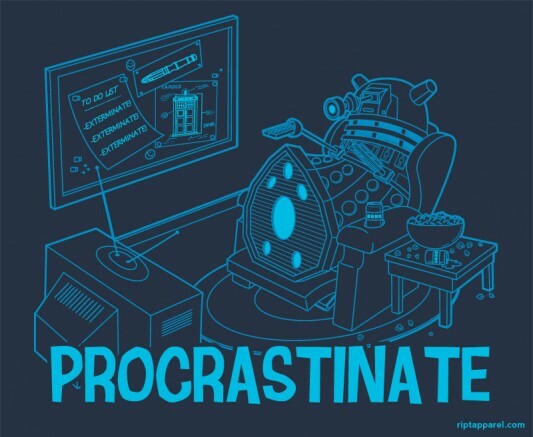 The design features an apparently lazy, couch potato Dalek neglecting the items on its To-Do list. On the list? Exterminate! Exterminate! Exterminate! Fairly simple. Look closely and you’ll see more Doctor Who images on its cork board. The t-shirt is available in men’s and women’s sizes for $10 each in blue. Kids sizes are $15 (Boys, Girls, and Toddler in what looks like charcoal; Onesies are $18 (in charcoal). You can also get the design on a Hoodie for $38 (in Men/Unisex sizes in blue).